1.5 In this policy, “we”, “us” and “our” refer to Pryor & Rickett Silviculture LTD. For more information about us, see Section 13. 3.3 We may process your account data (“account data”). The account data may include your name and email address. The source of the account data is you or your employer. The account data may be processed for the purposes of operating our website, providing our services, ensuring the security of our website and services, maintaining back-ups of our databases and communicating with you. The legal basis for this processing is the performance of a contract between you and us and/or taking steps, at your request, to enter into such a contract. 3.4 We may process your information included in your personal profile on our website (“profile data”). The profile data may include your name, address, telephone number, email address, date of birth, educational details and employment details. Profile data may be processed for [the purposes of enabling and monitoring your use of our website and services. The legal basis for this processing is our legitimate interests, namely the proper administration of our website and business. 3.5 We may process your personal data that are provided during the use of our services (“service data”). The service data may include your name, address, telephone number, email address, date of birth, educational details and employment details. The source of the service data is you or your employer. The service data may be processed for the purposes of operating our website, providing our services, ensuring the security of our website and services, maintaining back-ups of our databases and communicating with you. The legal basis for this processing is our legitimate interests, namely the proper administration of our website and business. 3.8 We may process information relating to transactions, including purchases of goods and services, that you enter into with us and/or through our website (“transaction data”). The transaction data may include your contact details, your bank details and the transaction details. The transaction data may be processed for the purpose of supplying the purchased goods and services and keeping proper records of those transactions. The legal basis for this processing is the performance of a contract between you and us and/or taking steps, at your request, to enter into such a contract and our legitimate interests, namely our interest in the proper administration of our website and business. 3.9 We may process [information that you provide to us for the purpose of subscribing to our email notifications and/or newsletters (“notification data”). The notification data may be processed for the purposes of sending you the relevant notifications and/or newsletters. The legal basis for this processing is the performance of a contract between you and us and/or taking steps, at your request, to enter into such a contract. 3.11 We may process general data. This data may include information specific to a contract, such as work site addresses. The source of this data is our website. This data may be processed for contract fulfillment. The legal basis for this is the performance of a contract between you and us and/or taking steps, at your request, to enter into such a contract. 4.3 We may disclose name, address or bank details to our suppliers or subcontractors insofar as reasonably necessary for the purposes of carrying out contract work. 4.4 Financial transactions relating to our website and services may be handled by our payment services providers, SagePay. We will share transaction data with our payment services providers only to the extent necessary for the purposes of processing your payments, refunding such payments and dealing with complaints and queries relating to such payments and refunds. You can find information about the payment services providers’ privacy policies and practices at https://www.sagepay.co.uk/policies/privacy-policy. (a) Personal data will be retained for a as long as we require this to provide you with the services ordered from us, and for a maximum period of 6 years afterwards. 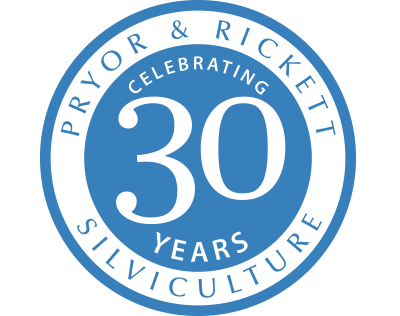 12.1 This website is owned and operated by Pryor & Rickett Silviculture LTD.
12.2 We are registered in England and Wales under registration number 03499298, and our registered office is at The Sheepcote, Monks Orchard Lugwardine, Hereford, Herefordshire, HR1 4AG. 13.1 Our data protection officer’s contact details are: Chris Hamill at our registered address.